Definition at line 21 of file PoolChunked.h. Definition at line 138 of file PoolChunked.cc. References M_MMAP_MAX, MEM_CHUNK_SIZE, MEM_MAX_MMAP_CHUNKS, and setChunkSize(). Definition at line 285 of file PoolChunked.cc. References assert, Chunks, clean(), Mem::Meter::currentLevel(), MemImplementingAllocator::flushMetersFull(), MemPoolMeter::inuse, MemImplementingAllocator::meter, MemChunk::next, and NULL. Definition at line 309 of file PoolChunked.cc. References assert, Mem::Meter::currentLevel(), MemPoolMeter::idle, MemPoolMeter::inuse, MemImplementingAllocator::meter, and p.
Definition at line 354 of file PoolChunked.cc. References chunk_capacity, Chunks, convertFreeCacheToChunkFreeCache(), MemImplementingAllocator::flushMetersFull(), MemChunk::inuse_count, MemChunk::lastref, MemChunk::next, nextFreeChunk, MemChunk::nextFreeChunk, NULL, MemChunk::objCache, and squid_curtime. Referenced by getStats(), and ~MemPoolChunked(). Definition at line 328 of file PoolChunked.cc. References allChunks, assert, Splay< V >::find(), freeCache, MemChunk::freeList, MemChunk::inuse_count, MemChunk::lastref, memCompObjChunks(), NULL, splayLastResult, squid_curtime, VALGRIND_MAKE_MEM_DEFINED, and VALGRIND_MAKE_MEM_NOACCESS. Definition at line 222 of file PoolChunked.cc. References Chunks, MemChunk, MemChunk::next, NULL, and MemChunk::objCache. Definition at line 319 of file PoolChunked.cc. References assert, Mem::Meter::currentLevel(), MemPoolMeter::idle, MemPoolMeter::inuse, MemImplementingAllocator::meter, and push(). Referenced by clean(), and ~MemPoolChunked(). Definition at line 183 of file PoolChunked.cc. References createChunk(), freeCache, MemChunk::freeList, MemChunk::inuse_count, MemChunk::lastref, nextFreeChunk, MemChunk::nextFreeChunk, NULL, MemImplementingAllocator::obj_size, MemImplementingAllocator::saved_calls, squid_curtime, and VALGRIND_MAKE_MEM_DEFINED. Definition at line 303 of file PoolChunked.cc. Definition at line 427 of file PoolChunked.cc. References MemPoolMeter::alloc, chunk_capacity, MemPoolStats::chunk_capacity, chunkCount, Chunks, MemPoolStats::chunks_alloc, MemPoolStats::chunks_free, MemPoolStats::chunks_inuse, MemPoolStats::chunks_partial, clean(), Mem::Meter::currentLevel(), MemPoolMeter::idle, MemPoolMeter::inuse, MemChunk::inuse_count, MemPoolStats::items_alloc, MemPoolStats::items_idle, MemPoolStats::items_inuse, MemPoolStats::label, MemPoolChunked(), MemImplementingAllocator::meter, MemPoolStats::meter, MemChunk::next, MemImplementingAllocator::obj_size, MemPoolStats::obj_size, MemAllocator::objectType(), MemPoolStats::overhead, and MemPoolStats::pool. Definition at line 418 of file PoolChunked.cc. 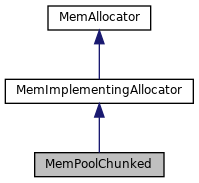 References chunk_capacity, Mem::Meter::currentLevel(), MemPoolMeter::idle, and MemImplementingAllocator::meter. Referenced by cbdataDump(), getStats(), and MemPoolMalloc::getStats(). Definition at line 160 of file PoolChunked.cc. References MemAllocator::doZero, freeCache, MemImplementingAllocator::obj_size, and VALGRIND_MAKE_MEM_NOACCESS. Definition at line 253 of file PoolChunked.cc. References chunk_capacity, chunk_size, Chunks, MEM_CHUNK_MAX_SIZE, MEM_MAX_FREE, MEM_MIN_FREE, MEM_PAGE_SIZE, and MemImplementingAllocator::obj_size. Definition at line 24 of file PoolChunked.h. Definition at line 64 of file PoolChunked.h. Referenced by convertFreeCacheToChunkFreeCache(), and MemChunk::MemChunk(). Definition at line 59 of file PoolChunked.h. Referenced by clean(), getStats(), idleTrigger(), MemChunk::MemChunk(), and setChunkSize(). Definition at line 58 of file PoolChunked.h. Referenced by MemChunk::MemChunk(), memCompObjChunks(), and setChunkSize(). Definition at line 60 of file PoolChunked.h. Referenced by getStats(), and MemChunk::MemChunk(). Definition at line 63 of file PoolChunked.h. Referenced by clean(), createChunk(), getStats(), setChunkSize(), and ~MemPoolChunked(). Referenced by MemPoolMalloc::allocate(), MemPoolMalloc::deallocate(), MemChunk::MemChunk(), and push(). Definition at line 61 of file PoolChunked.h. Referenced by convertFreeCacheToChunkFreeCache(), get(), and push(). Referenced by allocate(), MemPoolMalloc::allocate(), MemPoolMalloc::clean(), deallocate(), MemPoolMalloc::deallocate(), getInUseCount(), MemPoolMalloc::getInUseCount(), MemImplementingAllocator::getMeter(), getStats(), MemPoolMalloc::getStats(), idleTrigger(), ~MemPoolChunked(), and MemPoolMalloc::~MemPoolMalloc(). Definition at line 62 of file PoolChunked.h. Referenced by clean(), get(), and MemChunk::MemChunk(). 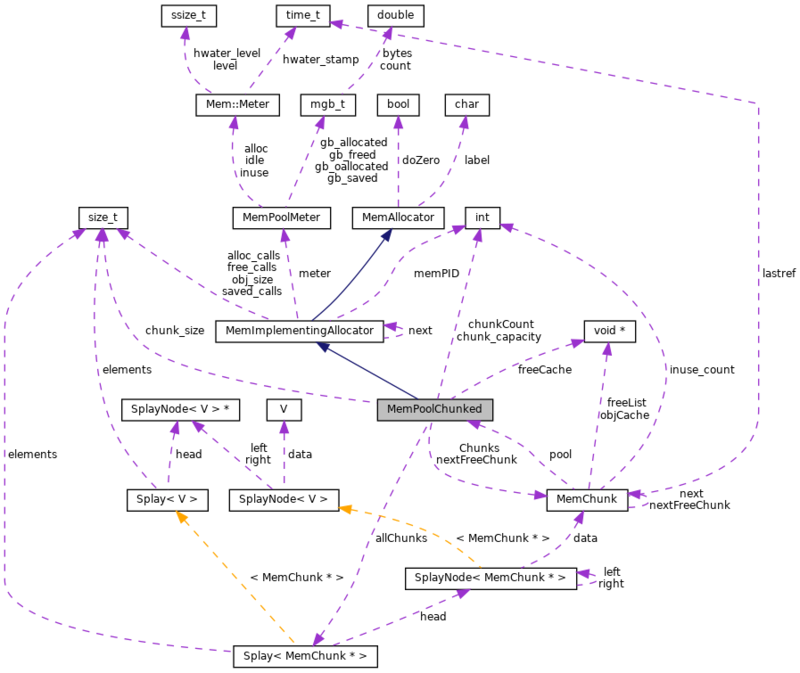 Referenced by MemPoolMalloc::allocate(), MemPoolMalloc::deallocate(), get(), getStats(), MemPoolMalloc::getStats(), MemChunk::MemChunk(), MemImplementingAllocator::objectSize(), push(), and setChunkSize(). Referenced by MemPoolMalloc::allocate(), and get().